Link to full report (with charts) here. Good morning. Below is the University of Oregon Regional Economic Indexes for January 2019. The release date is April 10, 2019. We thank KeyBank for their generous support of this project. Link to full report here! The moving average measure, which smooths out the volatility, was a more moderate 0.84, though still well above average (“zero” indicates average growth over the 1990-present period). All sectors made positive contributions to the measure. In particular, strong job growth in the manufacturing and construction sectors made large contributions to those sectors. The household sector continues to be supported by broad labor market indicators such as the unemployment rate but also experienced a gain as the equity market weakness of December reversed. 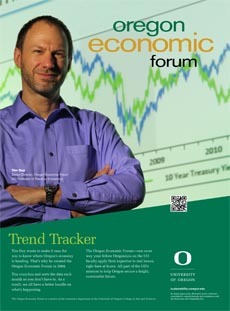 The University of Oregon Index of Economic Indicators rose in January for the third consecutive month, gaining 0.2 percent over December. Employment services payrolls (mostly temporary help jobs) jumped while initial unemployment claims edged down; the general trends of both indicators remain consistent with future job growth. Consumer confidence fell in January during the partial government shutdown (but rebounded in February). The interest rate spread fell sharply as market participants reduced their expectations for Federal Reserve interest rate hikes. Good morning. Below is the University of Oregon Regional Economic Indexes for November 2018. The release date is today February 14, 2019. We thank KeyBank for their generous support of this project. For all regions covered by this report, the moving average measures (which smooth monthly volatility) were above zero, indicating an above-trend pace of activity (trend activity differs across regions). New home construction was muted in all areas with near-neutral contributions from the building permits component. Residential housing sales were mixed with the Portland region experiencing a slowdown in home sales (reflected in a modest contribution to its measure of activity). The Eugene-Springfield measure again experienced a temporary gain in the waste component associated with the clean-up of a fuel spill in late October and early November; the positive impact will fade in the December numbers. Although overall low unemployment supported the measures, in many instances, the employment components made either negative or small positive contributions, a reflection of slower job growth in Oregon in the final quarter of the year.